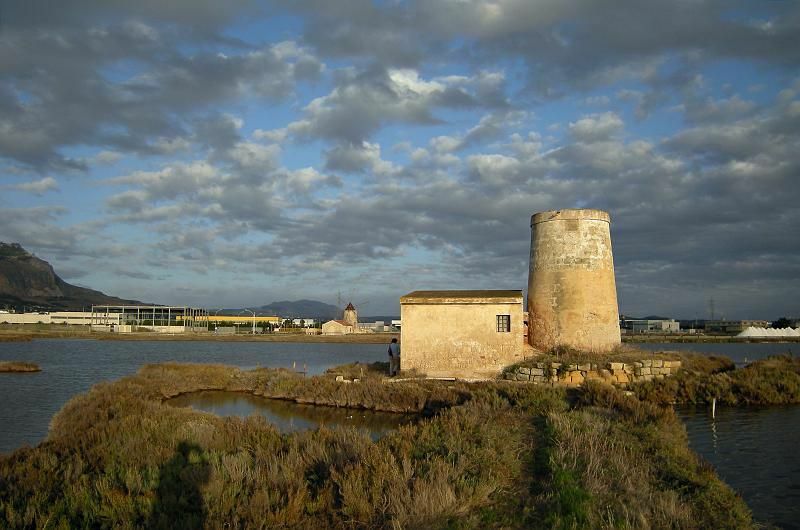 Half way between Trapani and Marsala on the SS115 the landscape turns white, with piles of salt and salt marshes, only dotted by the windmills which ground salt in former times. The product from this marshes is well regarded in Italy and has been in operations since the 12th century. Unluckily its production collapsed and only a little salt is produced nowadays for the pleasure of a few and on a very small scale. For a long stretch the saltpans spread without any modern building interrupting them. There sits the Riserva Naturale di Stagnone, wetlands which include the Isole delle Stagnone and part of Isola Lunga. The reserve has been established to prevent the shallow water of the lagoon to remain unspoilt. The site where Mozia lay is nearby on the minute Island of San Pantaleo. A Phoenician road leading to the mainland was left under water but it is still visible. The island was acquired by an archaeologist who devoted himself to excavating for years and managed to organize a Phoenician collection which is today exhibited in a museum. San Pantaleo after his dedicated work turned to be the Phoenician site that luckily nature has not been so hard on around the Mediterranean as Carthage was completely crushed by Rome, sprinkling salt everywhere for no plant or animal to grow or survive in it. The island is ideal to stroll along the signalled excavation tracks. There is a path going to the ancient port, dry dock and the road underwater. The Whiteker Museum is on the island. Its most important piece is Il Giovanetto di Mozia. The Museo Saline Ettore e Inferza will let you have and insight into what the process of salt was. This salt museum occupies the space of a windmill where salt was ground in old times. In the summer time visitors can rent a canoe and row into and out of the salt marshes. Opposite the pier a cafe looking onto the island and the lagoon serves drinks while the saltpans turn from white to pink when the evening approaches.